1986 - Venerable Bhikkhu Sanghasena founded the Mahabodhi International Meditation Centre (MIMC) in Leh, Ladakh. 1991 - Established the Mahabodhi Devachan campus on 200 acres of barren and isolated land in Choglamsar, approximately 10 kilometres away from Leh town. 1991 - Established the Mahabodhi Girls Hostel, a pioneering project providing holistic education and a safe home environment for under-privileged girls from remote homesteads scattered across Ladakh. 1992 - Established the Mahabodhi Residential School, dedicated to providing high quality holistic education aimed at eradicating illiteracy and poverty across the region. This school is now providing High School level education to some 600 students. 1992 - Established the Mahabodhi Meditation Centre, dedicated to promoting physical and mental well-being, social harmony and world peace. 1992 - Established the Mahabodhi Charitable Hospital - the first non-governmental hospital in Ladakh - dedicated to providing healthcare and support for under-privileged patients through a purpose-built and well-equipped 50 bed hospital. 1992 - Started the Mahabodhi Green Project, under which tens of thousands of trees have been planted on the once barren and isolated land at Mahabodhi Devachan. 1993 - Established the Mahabodhi Mobile Health Clinic, dedicated to providing regular healthcare and dental visits for communities in remote and previously inaccessible areas. 1995 - Hosted the International Sakyadhita Conference on Buddhist Women in Ladakh. Gyalmo Deskit (Her Highness the Queen of Ladakh) and His Holiness the Drikung Kyabgön Chetsang Rinpoche (Supreme Head of the Drikung Kagyu Lineage of Tibetan Buddhism) were the principal guests. Many eminent Buddhist women, nuns, teachers, leaders and thinkers of different Buddhist traditions and sects from all over the world participated in this historic gathering. This conference was of great significance in working toward improving the education, life standards and status, and general recognition of the Bhikkhuni ordination of nuns and women in Ladakh. 1996 - With the generous support of friends and well-wishers from Taiwan, organised a grand Sangha Dana - offering the monastic requisites to some 6,000 monks and nuns from across Ladakh. This offering was the first of its kind in Ladakh. His Holiness the Sakya Trizin Rinpoche (Supreme Head of the Sakya Lineage of Tibetan Buddhism), all the Supreme Heads of the different Buddhist sects of Ladakh, the President of the Ladakh Buddhist Association, the President of the Ladakh Monastery (Gompa) Association, and the Chief Executive Councillor of the Ladakh Autonomous Hill Development Council (LAHDC) were present, as well as many other local and international dignitaries. 1996 - Established the Mahabodhi Boys Hostel, dedicated to providing holistic education and a safe home environment for under-privileged boys from remote homesteads scattered across Ladakh. At present, there are some 150 boys living in this hostel. 1996 - Established the Mahabodhi New Delhi Branch. 1997 - Established the Mahabodhi Nunnery, a truly pioneering project dedicated to providing a fully integrated and holistic education for young nuns. 1998 - In collaboration with the International Association for Religious Freedom (IARF), based in the UK, organized a 3-day international conference for young adults of different faiths to promote inter-religious harmony, peaceful co-existence and brotherhood. Many delegates, drawn from different parts of India and overseas, participated in this important conference. All the religious heads of the various denominations of Ladakh attended and participated in the event. Dr. Karan Singh (Chairman of the Foreign Affairs Department and India's Ambassador to UNESCO) was the chief guest. The participants visited various religious places (a Buddhist temple, a mosque, a church and a Gurudwara) in Ladakh, with the intention of building greater understanding and mutual trust between the participants. 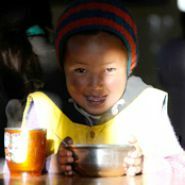 1999 - Founded the Mahabodhi Branch School in Tingmosgang village, dedicated to providing high-quality holistic education to students in this remote rural location, where at present some 150 students attend each day. Since 2001- Scores of Mahabodhi Residential School graduates have travelled to Bangalore, South India to pursue their higher education studies with the ongoing encouragement and support of the Mahabodhi International Meditation Centre. 2002 - Constituted the "Acharya Buddharakkhita Humanitarian Award" - awarded to those noble citizens, whose service to the poorest and most marginalized communities warrants both praise and recognition. The late Kushok Bakula Rinpoche (Head Lama of Ladakh), Shri. Thupstan Tsewang (Former Honourable Member of Parliament for Ladakh), Shri. B.K. Modi (Chairman and Founder of Spice Global India) & Lamdon Social Welfare, Leh are amongst the list of award recipients. 2003 - Established the Mahabodhi Home for the Aged and Destitute, a pioneering project dedicated to providing a safe residential home, personal and social care, and respect for the most vulnerable members of Ladakhi society. 2004 - Established the Mahabodhi Jetavana Monastery, dedicated to providing both traditional spiritual and modern-based education to young monks. Since 1996, Venerable Bhikkhu Sanghasena has been an active member of the International Association for Religious Freedom (IARF) and the International Association of Liberal Religious Women(IALRW), actively participating in their conferences in Italy, Hungary, South Korea and various parts of India. Besides this, he has also organised various interfaith meetings, seminars and dialogues aimed at promoting greater understanding and peace throughout the region. 2005 - Organised an international Grand Buddha Jayanti Celebration to commemorate the 2550th Buddha's birthday, at which Dr. A.P.J. Abdul Kalam (His Excellency the then President of India), Lt Gen. S.K. Sinha (the then Honourable Governor of Jammu & Kashmir), Shri. Ghulam Nabi Azad (the then Honourable Chief Minister of Jammu & Kashmir) were present. Many eminent dignitaries from different countries, as well as monks and nuns, participated in this week long celebration. Street campaigns advocating the eradication of animal abuse, alcohol, cigarette smoking and the taking of other intoxicating materials were organised. In addition, a large-scale peace march was organised. 2005 - Established the Mahabodhi Elder Women's Literacy Programme, dedicated to providing basic education and empowerment for elderly women across the Ladakh region. 2005 - Established the first school and hostel for blind and visually-impaired students in Ladakh, which was inaugurated by His Excellency Dr. A.P.J. Abdul Kalam (the then President of India), in the presence of His Excellency the Governor and the Honourable Chief Minister of Jammu and Kashmir. 2006 - Established the Mahabodhi Branch School in Bodhkharbu, dedicated to providing high quality holistic education for students living in this remote and under-developed village in the Kargil district of Ladakh. 2007 - Established the Mahabodhi Vocational Training Programme, a pioneering project dedicated to providing a practical vocational platform for school drop-outs, enabling them to develop and exhibit their talents in music, traditional woodcarving and painting, as well as providing them with a vital means of generating income. 2008 - Established the Mahabodhi Branch in Jammu district, dedicated to fostering and promoting social and mental harmony, as well as world peace. 09/2008 - Organised a 5-day International Youth Sangha Conference in association with the World Buddhist Sangha Council, whereupon representatives of the Theravada and Mahayana Buddhist traditions from different countries, including Taiwan, Sri Lanka, Malaysia and India, came together in order to promote greater understanding, universal brotherhood and world peace. 2010 - In collaboration with the Museum of World Religions, based in Taiwan, organised a 3-day International Buddhist Muslim Dialogue Conference in order to promote greater peace, harmony and friendship between the two most populous religions of Ladakh. His Holiness the Gyalwang Drukpa Rinpoche (Supreme Head of the Drukpa Lineage of Tibetan Buddhism), Shri. Nawang Rigzen Jora (Honourable Minister for Tourism and Culture, Jammu & Kashmir), Maulana Umair Ahmed Ilyasi, President, (All India Organisations of Imams of Mosques, New Delhi,) the President of the Ladakh Buddhist Association, the President of Anjuman Imamia, Leh, President Moin - ul- Islam, Leh, Shri. Asgar Ali Karbalai (Former Chief Executive Councillor, Kargil, LAHDC) and many other important dignitaries from the United States, Germany, Malaysia, Taiwan, France, Sri Lanka and India participated in this historic event. The students of various schools actively participated in this dialogue. Following this, all the participants visited and paid obeisance at the Leh Main Buddhist Temple, Leh Jamia Masjid, Leh Imambara and Imambara at Shey village. 2010 - Established the Mahabodhi Meditation Centre Branch in Chandigarh, dedicated to promoting social and mental harmony, and world peace. 2010 - Established the Mahabodhi Girls Hostel in Chandigarh, wherein 100 female students can be accommodated in a safe home environment where they can concentrate on their higher education studies.